Four young boys driving at top speed, are lucky to see this day as their car veered off the road and landed on a fence in Enugu State. The incident happened on Saturday on Ezeilo street, WAEC bus stop. 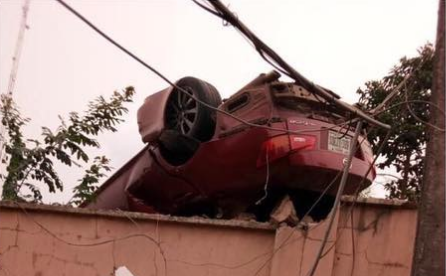 The car was said to have tumbled several times before eventually landing on the fence. It was gathered that, although the four occupants came out alive, they were seriously injured.